There Is Nothing Free Except……. “You must pay for everything in this world one way or another, there is nothing free except the grace of God. You cannot earn that or deserve it.” from the novel True Grit. No, there ain’t nothing free when a person is trying to make a go of it out here with the cattle and all. Sometimes money is pretty hard to come by and when it comes it seems to sometimes go out faster than its coming in. Then there’s the sucker biller. Things that a person really gets nothing for but in this day and age many times its the law you have to pay these bills. Such as different insurances and such. Years ago, and I ain’t all that old, there were very few sucker bills and a person worked for the things he needed and was sometimes able to even save some for hard times. Times were simpler then and I do miss that. When building a cattle outfit there’s a tremendous amount of work and long term investment put into it. More like a lifetime’s worth. Allot of sweat and back aches, allot of sleepless nights when the weather is rough. It ain’t a free ride by any means. Get a bug in the young calves with some rough weather to boot and a fella finds out what life is all about and it ain’t easy. There’s people problems too, from family to total strangers, a person never knows what a new day will bring. There ain’t nothing free in this life apart from God. Well, a person could say there’s allot of things that are free and we can enjoy them. Yes, true, but all are provided for us by the grace of God. Its not only salvation that is provided free to us undeserving folks, but all the little things too. All those small and large joys that warm the heart are gifts from God. Salvation is the ultimate gift though and without it everything else is done for nothing. It took me decades to realize that but thank God I do realize that now before its too late. A free gift for us, but it cost and incredible price to obtain it for us. Nothing we could ever do could take its place. Take the place of Jesus on that old rugged cross, shedding His Blood for us, to pay for our sins. Yes, its free to us, offered freely to any and all who will just surrender and accept the very fact that Jesus suffered, died and rose again to save us from ourselves. This is the Good News, this is the message of all the ages. That we have been offered a free gift, we just have to accept it in faith! Its getting near Christmas and things are holding together fairly well around this outfit. The weather has been basically mild so far and that’s OK with me. The cattle are doing well, no stress at all and that means no stress for the guy taking care of them too. I have been planning on setting up around here for transporting and selling grain but that’s as far as it has gotten so far, just planning. Funny how I never can quite get to that basically simple job. Always something else pops up. Maybe try again tomorrow. A couple of days ago I came across something from the Bible. I had read it many, many times before and as is the case so many times a person doesn’t catch the huge significance of the words till someone else brings it to my attention. 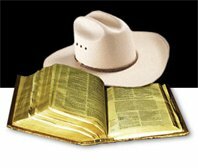 I read this the other day on the computer, in a little thing by a cowboy preacher from Texas. Every once in a while something like this hits a person, seen it a hundred times and never really paid much attention to it. But just examine the words that Mary, the mother of Jesus said at the wedding feast. What ever He says, do it! Amen? I always say about the Bible, “God said it, I believe it, that settles it!” Although even if I didn’t believe it, it still would be true but I figure it don’t hurt being on the winning side in all of this. The command to “do it” just staggers me though. How simple, how true! Just obey! In other words that is putting faith into action. Because without doing so, faith is dead. Sometimes we can complicate the Bible, we can create religion. But there ain’t nothing better than just getting down to the nitty gritty and believing it and obeying it and just doing it! And sometimes we don’t quite understand it, but when we do it, the understanding comes. 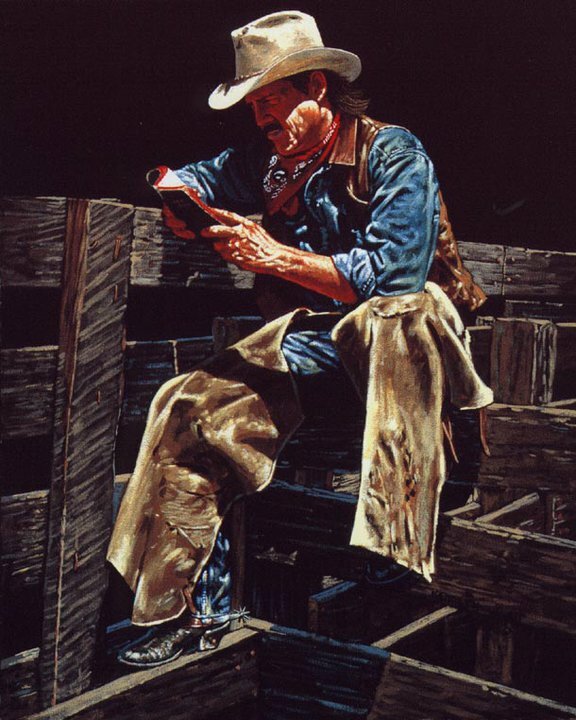 A feller can sit around and try and try and try to figure out the Word, and basically never get anywhere in their whole lifetime as they try and try to dissect the Bible. Trying to prove if its true. But take a verse or two and get off our butts and obey it, just “do it” and understanding comes to even the simplest of the simple which includes me! The wind is roaring outside this evening as I write, a rather brutal day out there. Got everything done I have to get done and head for cover. The cows are doing OK, so that takes that off my mind. The crops are in for the year, although there’s a few hundred round bales of hay and corn stalks out there yet to bring home. And with over four inches of rain the past few days that job will be put off for a bit. I came across this verse the other day in this translation of the Bible and it floored me! This excites me more than I can write! Oh Lord, what a promise!